Happy Thursday everyone. I wish I could say it was a happy day over here, but my son is crazy, super sick! We are on day three of him not being able to keep anything down. It breaks a mommy’s heart to see such a little one in so much discomfort. Please think of him today…he so badly wants to enjoy his first Jog-a-thon at school tomorrow. I don’t have the heart to tell him that I don’t think that will be happening. There’s always next year. But for some happier news. Here is one of my newest design boards I did for an international client. They don’t know what they are having, so I just can’t wait to see if this ends up a space for a little girl or a little guy. I believe this is my first gender neutral nursery I have done and I really enjoyed it. Gone are the days of just yellow and green. 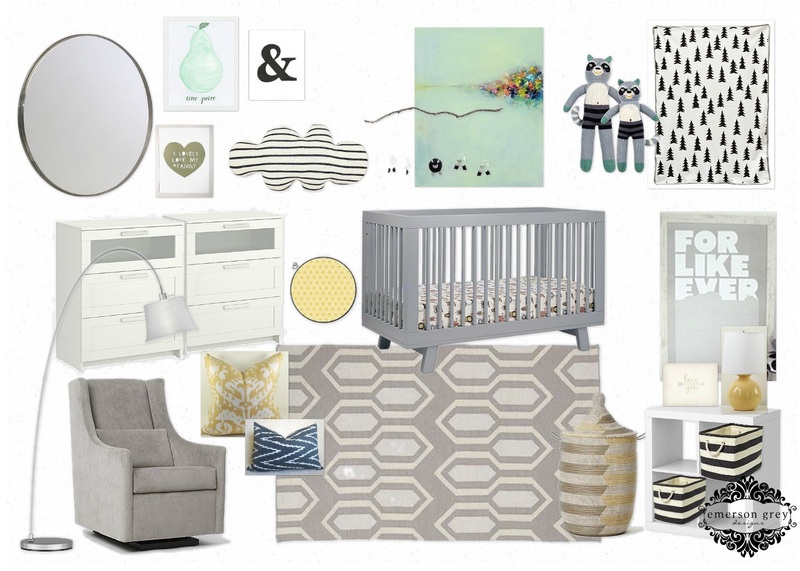 We used a palette of aqua, grey, butter yellow and punches of black and white for this nursery. One of my favorite cribs, the Babyletto Hudson in grey has been purchased already for the space. I just love how a crib in a different finish can stand out in such a fun way in a space. It also allows you to go light on the amount of bedding pieces used without the crib appearing too plain. We have decided a butter yellow honeysuckle print sheet is all we need for this design. This client was such a pleasure…I seem to get the best clients, I love it!